Breast asymmetry is very common and normal. What you see on your chest is comprised of the actual breast tissue and the shape of your chest wall. Even mild curvature of the spine can change the apparent size of your breasts. Mild to moderate breast asymmetry is quite often not noticed by the patient. Postural position can influence the size of your breasts to compensate for even moderate breast differences. Mild breast asymmetry can be treated with breast augmentation if your goals are to be larger. Breast implants come in wide ranges of sizes and shapes to compensate for breast asymmetry. The most important thing to remember is the goal is to be similar. Not the same. Perfect symmetry is really not possible. I always tell my patients your breasts are sisters and not identical twins. 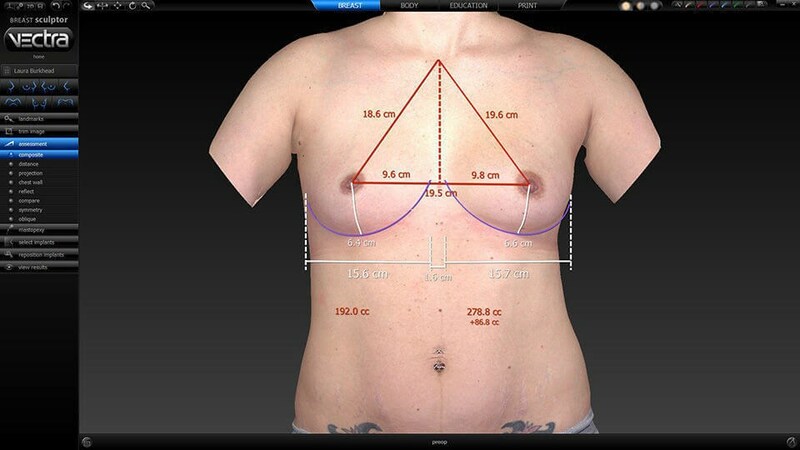 Vectra Imaging System is a breast assessment and morphing program. The image created is in 3D and can be moved in virtually all positions. 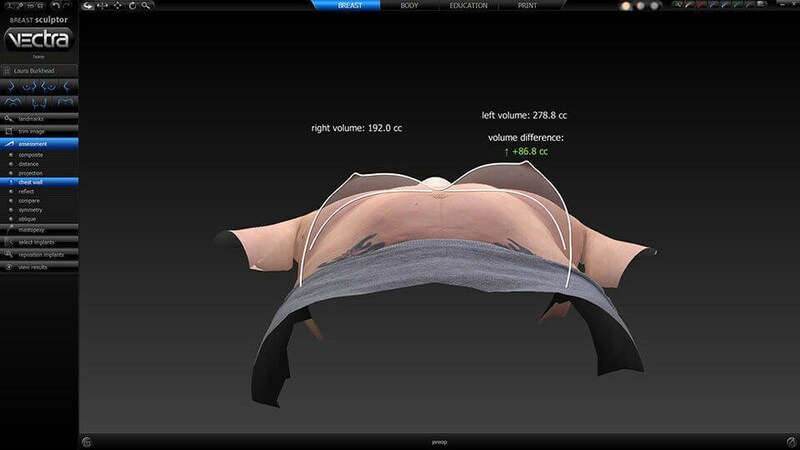 The image below displays the standard breasts measurements taken by most plastic surgeons for breast assessment. Her breasts are similar except for mild difference in breast volume. The left breast is larger by almost 87cc. That is enough of a difference to most likely use a different sized breast implants for each breasts. This worms eye view confirms the slight difference in breast volume. The volume difference is most likely do to a larger breast on the left than a chest wall abnormality. For her mild breast asymmetry, she is a great candidate for breast augmentation.